So John Paul II set the precedent for the next pope, and the next, and the next for dealing with dissident bishops on the matter of women priests. Pope Benedict has also dealt strongly with the issue, again paving the way for other popes who might need to stand against dissident bishops. What about precedents set during the pontificate of the venerable John Paul II on altar girls? How does this relate to the topic here? Or is it just one of the things that annoys you about the disciplines in the Latin rite today and you decided to poke it in here because I mentioned women? The "supreme pontiff" went and did what he wanted anyways. You mean as your church has done all along? Not exactly. Our One, Holy, Catholic and Apostolic Church has always wanted to preserve and transmit the Orthodoxy it received from the Apostles, neither adding to nor subtracting from it. And so we have done. So yes we also have done what we wanted, but what we wanted differed from the Vatican's wishes and desires. I agree. The One, Holy, Catholic, and Apostolic Church has always preserved and transmited orthodoxy. The Eastern Orthodox Church, however, has not. In the words of Pope Benedict, we are assured that there has been NO doctrinal or theological creep in the last thousand years within Orthodoxy. This fact alone points to the utter superfluity of both the Papacy and the Magisterium, We have kept the faith intact without them. All praise to the Spirit of Truth who indwells the Church. the Church of the Fathers is present in unbroken continuity." ~"Principles of Catholic Theology," Cardinal Ratzinger, Ignatius Press, 1987. /\ It is odd that the words of Pope Benedict may be counted as words of a "Church Father against the Papacy" because he has shown that the Papacy is simply not needed in the Church, certainly not for the preservation of right doctrine. True. But I do believe the Papacy is necessary for unity. But, as Fr. Ambrose points out, Orthodoxy has disproved that "need." I have a question regarding the papacy and it may seem silly or unimportant but if I don't ask I'll never know the answer. In the discussions that I have seen (there maybe some threads I haven't seen) I haven't seen any discussion about the False Donation of Constantine or the False Decretals of Isidore and what effect these documents had on the Western view of the Church and the powers of the papacy. So my question is: Do these documents matter and if so how did they affect the western view of the Church? I don't quite understand this. 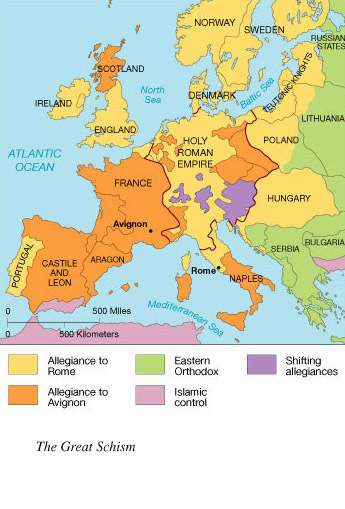 Where was Rome's ability to preserve unity after the 4th ecumenical council, when Constantinople broke from her in 1009, when much of the rest of the east broke from her in 1054, when anglicanism was created, when lutheranism was created, and so on? (btw, I do not mean to put EO/OO on the same level as Anglicans, or Anglicans on the same level as Lutherans... the point, of course, is simply that Rome doesn't exactly have a track record for keeping people part of one big, happy church family). Rome has not shown that it is necessary for maintaining unity, or that it is helpful in rebuilding unity once it is lost. In studies on the Great Pyramid, a lot of energy is expended on explaining how it was built. The problem, of course, is that one a building is finished, its scaffolding is taken away: the idea that it is not to leave a trace, just the building. and the anti-historical Vita Beati Sylvestri served as scaffolding for the Ultramontanists to build themselves up a see and a basilica, whose top may reach unto heaven; and make themselves a name, lest they be scattered abroad upon the face of the whole earth-that "font of unity," the Vatican papacy. Their work been done, they are now discarded even by the Ultarmontanist (who resent us bringing them up). Btw, a parallel process can be seen in the excessive dogma of the Vatican on the Theotokos stemming from Jerome's mistranslation of Genesis 3:15, which the Vatican's translators now admit is mistaken. The Oriental Orthodox broke communion with the pre-schism Church much earlier. Was that also Rome's fault? Anglicans and Lutherans broke away for reasons which, as you pointed out, were much different than the reasons Eastern Orthodoxy and Roman Catholicism remain separated. In fact, I think the protestant examples are more of a result of a Western mentality ("everything my way") than issues with Roman Catholicism's ability to unite. Regardless of the divisions, the papacy still stands--First Rome still stands. Leaders in both East and West have been working to heal the division. Nobody, on either side, is looking to abolish the Papacy. Where there is disagreement, they are only seeking to better define/refine the role of the Papacy in a united Church. Even Archbishop Hilarion recognizes the advantages the Western ecclesiastical structure affords. When the East and West re-unite (which I pray for and truly believe will happen) the Pope will be the First Among Equals. Rome will be Protos. While I don't agree that the Papacy is necessary for dogmatic unity, I do think a church united under a Papacy serves some useful purposes. One, it could help with canonical disputes such as an official recongition of who's in communion with the Church, whose authority extends over what, what a church's status is (e.g. autocephalus), and similar issues. Orthodoxy currently struggles with resolving these issues, and I think it's due to a lack of leadership. Two, it could help clarify what the Church's official teaching is on contemporary issues. For example, it could respond quickly and officially to issues like the Church's position on Islam after the 9-11 attacks. Three, it could engage in ecumenical dialogues more effectively. As it is, various Orthodox Churches are independent and free to pursue their own dialogues with or without one another, which means that a dialogue would have to be repeated over and over with different churches to achieve the same results. Much more could be said, but my point is that it *does* have its advantages as well. I have to disagree. I don't see those as advantages. We may have issues to resolve but they will be resolved in a conciliar manner not a papal one. We are just matching the Vatican's rhetoric with its record. Were it not for the spread of the Vatican's communion in Latin America (not without the Spanish Inquisition-the existence of Candomblé, Voodoo, "Los Costumbres" etc. call into question how successful that was), the even divide between Protestants and the Vatican in Europe would pose a more visible question of the Vatican's abilit to unite. Given the inroads of the Protestants lately into Latin America, that question might come to the fore. Regardless of the divisions, the papacy still stands--First Rome still stands. Would you have said that, say, in 1378? Define "still stands" The office of the pagan kings of Rome still stands-the Roman emperors gave it to the archbishop of Rome, hence "pontiff"-but not in a form they would recognize. The monastic order of Gautama Siddhartha a/k/a "the Buddha" still stands, as does the Imperial House of Japan. Neither has induced me towards Buddhism nor Shintoism. The Archbishoprick of Cantebury stills stands, from the time of Pope St. Gregory the Great. Need I comment how well it stands? Leaders in both East and West have been working to heal the division. Nobody, on either side, is looking to abolish the Papacy. So two the formation of EA in the West outside of Italy having no reference to Rome shouldn't concern or vex us in the slightest. The model of church unity between East and West will be discussed by the Mixed Catholic-Orthodox Theological Commission that will meet after a six-year break in the fall of 2006. It is clear that this model will be hypothetic, since there remain many obstacles, both of dogmatic and of ecclesiological character, for the restoration of the full communion. However, the main obstacle to unity, according to many Orthodox theologians, is the teaching on the primacy of the Bishop of Rome. It is this teaching that will be discussed in the framework of the Mixed Commission. In this context unacceptable and even scandalous, from the Orthodox point of view, are precisely those titles that remain in the list, i.e. Vicar of Jesus Christ, Successor of the Prince of the Apostles, Supreme Pontiff of the Universal Church. The title "Supreme Pontiff" (pontifex maximus) originally belonged to the pagan emperors of Rome. It was not rejected by Emperor Constantine when he converted to Christianity. With relation to the pope of Rome the title "Supreme Pontiff of the Universal Church" points to the pope's universal jurisdiction which is not and will never be recognized by the Orthodox Churches. It is precisely this title that should have been dropped first, had the move been motivated by the quest for "ecumenical progress" and desire for amelioration of the Catholic-Orthodox relations. With the convening of the EA, the long overdo to see "historical and theological realities." We were told at the time of the dropping of the title that we would "just get over it." I think we should. William Tighe, a communicant of the Vatican "always imagined that its removal by the present pope was an act of “ecumenical honesty,” no more and no less." Time has come for the Orthodox for such honesty. No discussion of the EA and the diptychs at the "Great and Holy Council" will progress without it. Where there is disagreement, they are only seeking to better define/refine the role of the Papacy in a united Church. Well, we have a Romanian bishop in Rome and a Greek Metropolitan of Italy: uniting them in one Episcopal Assembly moots the issue of what the Vatican wants to do. Even Archbishop Hilarion recognizes the advantages the Western ecclesiastical structure affords. Can we get a quote of what you are refering to here? When the East and West re-unite (which I pray for and truly believe will happen) the Pope will be the First Among Equals. Rome will be Protos. Only if he confesses the Orthodox Faith. As Fr. Ambrose has posted, there is considerable doubt even if and when. The Vatican has four patriarchs in Antioch. We have two, and only one if you do not count the OO. And our "problems" in this area pales to similiar issues the Vatican has (sede vacantists, Lefebrists, SSPIX, "Priestly Society of St. Josapht," etc, not to mention the Protestants, if you are going on the basis of the patrimony of the patriarchates). Can you point to the Vatican's great success on this? Three, it could engage in ecumenical dialogues more effectively. That's a good thing? Even if it is, what ecumenical triumph has the Vatican had? As it is, various Orthodox Churches are independent and free to pursue their own dialogues with or without one another, which means that a dialogue would have to be repeated over and over with different churches to achieve the same results. More often than not the papal manner is a conciliar one!! Reality is never as terrifying as the fantasy. Those words of Pope Benedict are very circumspect. Remember that the Catholic Church recognizes things in the fathers that Orthodox believers reject vehemently. Remember that the Catholic Church also recognizes that the Catholic Church also holds the fullest form and content of the Church of the Fathers in unbroken continuity. There's a complexity in these occurrences that cannot be discussed in sound bites. It is important to know how they were false, for their contents were not necessarily false, though their proofs and attributions often were. It is important to know why they were written, and that is not nearly as crass, in reasoning, as one might imagine. Lies never hold and it did not take over-long to expose these documents, which were really only important in specific times and places and certainly not universally distributed, but they are very interesting and the idea that the Church and heads of the Church rule the secular world, which is a huge part of both documents, is not something that we should sneer at. We have seen in Orthodoxy how it does not work to spiritual perfection when the roles are reversed and the secular Emperors and Tsars rule the Church. If I were to err, I would much rather err in saying that the Christian world looks to the Church for leadership in all but the most banal matters. At any rate, you should carefully read those two entries. I find them to be fascinating and not at all abhorrent but then I find history to be exceptionally fascinating, and I understand human weakness, for I live it daily. God forbid they ever really get down to examining the histories of our respective lived memories. Saints and sinners both will cringe. My sister, even a broken clock is right twice a day. The following comes from a cordial dialogue I had with an Eastern Catholic on CAF on a very interesting and crucial topic. I've included just my main points to get across the fact that, not only did the Church believe a pope could espouse heresy, but that an Ecumenical Council could also anathematize him and render him accountable to the Council, without of course minimising the sense of importance and esteem given to the See of Rome. "Pope Vigilius (537-555), who had very little backbone in conflict situations, first gave way and condemned the three chapters in his Iudicatum of 548. Faced with a storm of protest in the West, where the pope was accused of betraying Chalcedon, he made an about-face and retracted his condemnation (Constitutum, 553). The emperor in turn called a council at Constantinople (the Second Council of Constantinople, 553) made up only of opponents of the three chapters. It not only condemned those three chapters but even excommunicated the pope. This was a unique case of an ecumenical council setting itself clearly against the pope and yet not suffering the fate of Ephesus II. Instead, over time it was accepted and even recognized as valid by the pope. The council got around the papal opposition by referring to Matthew 18:20 (“Where two or three are gathered in my name…”): no individual council could therefore forestall the decision of the universal Church. This kind of argument was invalid, of course, because the pope was not alone; the entire West was behind him, and yet it was not represented at the council. Broken in spirit, Vigilius capitulated after the end of the council and assented to its condemnation of the three chapters. The result was a schism in the West, where the pope was accused of having surrendered Chalcedon. A North African synod of bishops excommunicated the pope, and the ecclesial provinces of Milan and Aquileia broke communion with Rome….The Spanish Church did not separate from Rome, but throughout the Middle Ages it refused to recognize this Council. The authority of the papacy in the West had suffered a severe blow with regard to dogma as well" (Schatz, Klaus, Papal Primacy. From Its Origins to the Present, 1996, Liturgical Press: Collegeville, p. 53). Vigilius was caught between a rock and a hard place as he was facing strong pressure from two opposing factions – those loyal to the Council who tried to express the faith according to a more Cyrillian way in attempt to bring back the Oriental Orthodox to full communion with the Greek (Roman) Orthodox, and those loyal to the so-called “diophysite” theology of Chalcedon. His actions even led to his excommunication by the North African churches. “One should not contradict the Latins when they say that the Bishop of Rome is the first. This primacy is not harmful to the Church. Let them only prove his faithfulness to the faith of Peter and to that of the successors of Peter. If this is so, let him enjoy all the privileges of pontiff...Let the Bishop of Rome be successor of the orthodoxy of Sylvester and Agatho, of Leo, Liberius, Martin and Gregory, then we also will call him Apostolic and the first among the other bishops; then we also will obey him, not only as Peter, but as the Saviour Himself" (Meyendorff, J., ed., the Primacy of Peter, 1992, SVSP: Crestwood, p. 86). Am I correct in saying that your major premise in this argument consists of the Roman Catholic view that communion with the pope is an unconditional precept of being in communion with the Church? In that case, were those who excommunicated Vigilius at Constantinople II in communion with the Church? If not, then they committed a schismatic act and all sessions subsequently held without the pope automatically become schismatic acts. If yes, then the edifice immediately collapses, taking with it the Vatican I’s defined dogma of papal supremacy. Now as regards the African churches’ excommunication of Vigilius after the Council (as well as that of the churches of Milan and Aquileia), these actions were clearly a case of the rejection of a pope whose orthodoxy had been vindicated by the Council after his denunciation of the heretical Three Chapters. There would be no question, therefore, that these churches can be considered to have been outside Orthodoxy. I’m beginning to see a pattern akin to that observable in many of the ultra-montane sympathisers throughout history: modern Roman Catholic doctrine is the standard by which the authenticity of any historical document should be judged. It is a trait of the works of Dom Chapman, it is also a trait of the ultra-montane party at Vatican I (some of whom refused to acknowledge that the Sixth Ecumenical Council was in fact “ecumenical” because it had condemned pope Honorius! The lengths people will go in their subservience to papacy…) Granted, the injurious slanders to the memory of pope Vigilius had been established as forgeries, but you have not made any compelling case that we should equally consider the proven authentic acts of the excommunication of Vigilius as forgeries aside from your opinion. Once again I refer you to the statement of the Catholic Dictionary that this is "an attempt to deny the most patent facts, and treat some of the chief documents as forgeries," and "unworthy of serious notice." “Le très religieux pape de l’ancienne Rome [s’est rendu lui-même] étranger à l’Église catholique en défendant l’impiété des chapitres et, d’autre part, en se séparent de lui-même de votre communion […]. Puis donc qu’il s’est rendu étranger aux chrétiens, nous avons jugé que son nom ne sera pas récité dans les saints diptyques, afin que nous ne nous trouvons pas, par ce moyen, en communication avec les impieties de Nestorius et de Théodore […]. L’unité avec le siège apostolique, nous la servons et vous la gardez, ceci est certain. La transformation de Vigile, ou de qui que ce soit d’autre, ne peut en effet nuire à la paix des Églises.” ” (Sotinel, C 2000, Le concile, l’empereur, l’évêque, in ‘Orthodoxie, Christianisme, histoire’, ed. Elm, S et al, École français de Rome, p. 294). "The plans of the most pious emperor are in conformity with his actions undertaken for the unity of the holy Churches. Let us therefore serve unity with the apostolic see of the all-holy Church of Old Rome by fulfilling everything according to the terms of the imperial decree which has just been read” (I am indebted to Fr. Andrew Wade from Fr. Ambrogio’s parish for editing my translations). “As such, the reality of the importance of Rome is not entirely dispensed of, but the particular status of the apostolic see in no way guarantees the orthodoxy of her incumbent in the eyes of the emperor and the fathers of the council.” (My translation). From these extracts we can definitively establish two critical facts, both of which refute any attempts to both excuse Vigilius’ excommunication, and excuse it on non-dogmatic grounds. Aside from the obvious, the citations draw particular attention to the grounds of Vigilius’ excommunication. The emperor gives explicit reason for his sentence –he is preserving the Church from communion with Nestorian sympathisers, a clear indication of which, for both him and the council, was the failure to condemn the three chapters. The topsy-turvy actions of the pope, by this stage a defender of the three chapters, bring him under the condemnations reserved for the heretics. Let’s consider for a moment what the consequences for the Church would have been had Vigilius’ papacy been informed by the prevailing dogmatic conditions of the post-Vatican I church of Rome. We would unquestionably have a Church bound to heretical teaching. That Rome’s doctrinal authority had been grievously hurt by this episode is evident in the ensuing schism between several important Sees in the West and the pungent admonitions given to successive pontiffs to avoid the fate that had tarnished the memory of Viglius. St. Columbanus did just that, lamenting how “sad it is when the catholic faith is not preserved in the apostolic see” (Schatz 1996, p. 54) gives a stern warning to pope Boniface IV lest he follow his predecessor’s lack of vigilance (ibid.). “The authority of the council is legitimate if its orthodoxy is proven. It is not the conciliar institution which determines orthodoxy, but orthodoxy which qualifies the council as an institution.” (My translation). c) he was ultimately reconciled to the Council’s decisions. I now pose the following questions: who was and who wasn’t in the Church during the six months of the pope’s isolation from the Council? Were those in communion with the excommunicated pope Vigilius in communion with the Petrine Office? One is obliged to admit a radical development (if one can call it that) in the doctrine of the fundamental nature of church authority on the part of the Vatican I-era church of Rome. How do you reconcile the Vatican dogma’s extraordinary powers assigned to the pope in light of the historical conscience of the Church of the first millennium clearly allowing for the possibility to call into question the pope’s doctrinal orthodoxy? Many Orthodox Churches have know the reality. They have no use for the promised fantasy. Prodromos posted on anothe forum this, I'll have to give it a looksy.
. . . "The Lord, wishing to recall to a proper humility the yet feeble hearts of his disciples, said to them, * If any man desire to be first, the same shall be last of all;' whereby we are clearly taught that he who is truly high is he who is most humble in mind. Let us, therefore, beware of being of the number of those ' who love the chief seats in the synagogues, and greetings in the markets, and to be called of men, Rabbi, Rabbi.' In fact, the Lord said to his disciples, * He ye not called Rabbi, for one is your Master, . . . and all ye are brethren. Neither be ye called Fathers, for ye have but one Father?
" What then could you answer, beloved brother, in the terrible judgment to come, who desire not only to be called Father, but universal Father of the world ? Beware then of evil suggestions ; fly from- the counsel of offence. ' It is impossible] indeed, ' but that offences -will come ; but] for all that, ' WO unto him through whom they come P In consequence of your wicked and vainglorious title, the Church is divided and the hearts of the brethren are offended. . . i " I have sought again and again, by my messengers and by humble words, to correct the sin which has been committed against the whole Church. Now I myself write. I have omitted nothing that humility made it my duty to do. If I reap from my rebuke nothing better than contempt, there will nothing be left for me but to appeal to the Church." You can listen to Archbishop Hilarion reference the fact that First Rome still stands and that the Roman Catholic structure is probably better. Chrys., Hom., liv: He adds ‘of Philip,’ to distinguish it from the other Caesarea, of Strato. And He asks this question in the former [p. 580] place, leading His disciples far out of the way of the Jews, that being set free from all fear, they might say freely what was in their mind. Raban. : He enquires the opinions of His disciples and of those without, not because He was ignorant of them; His disciples He asks, that He may reward with due reward their confession of a right faith; and the opinions of those without He enquires, that having the wrong opinions first set forth, it might be proved that the disciples had received the truth of their confession not from common opinion, but out [p. 582] of the hidden treasure of the Lord’s revelation. Jerome: This return Christ makes to the Apostle for the testimony which Peter had spoken concerning Him, “Thou art Christ, the Son of the living God.” The Lord said unto him, “Blessed art thou, Simon Bar-jonas?” Why? Because flesh and blood has not revealed this unto thee, but My Father. That which flesh and blood could not reveal, was revealed by the grace of the Holy Spirit. By his confession then he obtains a title, which should signify that [p. 583] he had received a revelation from the Holy Spirit, whose son he shall also be called; for Barjonas in our tongue signifies The son of a dove. Aug., Retract., i, 21: I have said in a certain place of the Apostle Peter, that [p. 585] it was on him, as on a rock, that the Church was built. but I know that since that I have often explained these words of the Lord, “Thou art Peter, and on this rock will I build my Church,” as meaning upon Him whom Peter had confessed in the words, “Thou art Christ, the Son of the living God;: and so that Peter, taking his name from this rock, would represent the Church, which is built upon this rock. For it is not said to him, Thou art the rock, but, “Thou art Peter.” But the rock was Christ, [1 Cor 10:4] whom because Simon thus confessed, as the whole Church confesses Him, he was named Peter. Let the reader choose whether of these two opinions seems to him the more probable. According to this promise of the Lord, the Apostolic Church of Peter remains pure and spotless from all leading into error, or heretical fraud, above all Heads and Bishops, and Primates of Churches and people, [p. 586] with its own Pontiffs, with most abundant faith, and the authority of Peter. And while other Churches have to blush for the error of some of their members, this reigns alone immoveably established, enforcing silence, and stopping the mouths of all heretics; and we [ed. note: The editions read here, ‘et nos necessario salutis,’ the meaning of which, says Nicolai, it is impossible to divine], not drunken with the wine of pride, confess together with it the type of truth, and of the holy apostolic tradition. Chrys. : See how Christ leads Peter to a high understanding concerning himself. [p. 587] These things that He here promises to give him, belong to God alone, namely to forgive sins, and to make the Church immoveable amidst the storms of so many persecutions and trials. Jerome: Bishops and Presbyters, not understanding [p. 588] this passage, assume to themselves something of the lofty pretensions of the Pharisees, and suppose that they may either condemn the innocent, or absolve the guilty; whereas what will be enquired into before the Lord will be not the sentence of the Priests, but the life of him that is being judged. Jerome: When then above He sends His disciples to preach, and commands them to proclaim [p. 589] His advent, this seems contrary to His command here, that they should not say that He is Jesus the Christ. To me it seems that it is one thing to preach Christ, and another to preach Jesus the Christ. Christ is a common title of dignity, Jesus the proper name of the Saviour. Origen: And observe that it is not said, ‘He began to say,’ or ‘to teach,’ [p. 590] but “to shew;” for as things are said to be shewn to the sense, so the things which Christ spake are said to be shewn by Him. Nor indeed do I think, that to those who saw Him suffering many things in the flesh, were those things which they saw so shewn as this representation in words shewed to the disciples the mystery of the passion and resurrection of Christ. At that time, indeed, He only “began to shew them,” and afterwards when they were more able to receive it, He shewed them more fully; for all that Jesus began to do, that He accomplished. Jerome: We have often said that Peter had too hot a zeal, and a very great affection towards the Lord the Saviour. Therefore after that his confession, and the reward of which he had heard from the Saviour, he would not have that his confession destroyed, and thought it impossible that the Son of God could be put to death, but takes Him to him affectionately, or takes Him aside that he may not seem to be rebuking his Master in the presence of his fellow disciples, and begins to chide Him with the feeling of one that loved Him, and to contradict Him, and say, “Be it far from thee, Lord;” or as it is better in the Greek, ιλεως σοι Κυριε, ου μη εσται σοι τουτο, that is, Be propitious to Thyself, Lord, this shall not be unto Thee. 15. So when they had dined, Jesus says to Simon Peter, Simon, son of Jonas, love you me more than these? He says to him, Yea, Lord; you know that I love you. He says to him, Feed my lambs. 16. He says to him again the second time, Simon, son of Jonas, love you me? He says to him, Yea, Lord; you know that I love you. He says, to him, Feed my sheep. 17. He says to him the third time, Simon, son of Jonas, love you me? Peter was grieved because he said to him the third time, Love you me? And he said to him, Lord, you know all things you know that I love you. Jesus says to him, Feed my sheep. THEOPHYL. The dinner being ended, He commits to Peter the superintendence over the sheep of the world, not to the others: So when they had dined, Jesus says to Simon Peter, Simon, son of Jonas, Do love you Me more than these do? AUG. Our Lord asked this, knowing it: He knew that Peter not only loved Him, but loved Him more than all the rest. AUG. While our Lord was being condemned to death, he feared, and denied Him. But by His resurrection Christ implanted love in his heart, and drove away fear. Peter denied, because he feared to die: but when our Lord was risen from the dead, and by His death destroyed death, what should he fear? He says to Him, Yea, Lord; you know that 1 love You. On this confession of his love, our Lord commends His sheep to him: He says to him, Feed My lambs. as if there were no way of Peter’s showing his love for Him, but by being a faithful shepherd, under the chief Shepherd. CHRYS. That which most of all attracts the Divine love is care and love for our neighbor. Our Lord passing by the rest, addresses this command to Peter: he being the chief of the Apostles, the mouth of the disciples, and head of the college. Our Lord remembers no more his sin in denying Him, or brings that as a charge against him, but commits to him at once the superintendence over his brethren. If you love Me, have rule over your brethren, show forth that love which you have evidenced throughout, and that life which you said you would lay down for Me, lay down for the sheep. He says to him again the second time, Simon, son of Jonas, love you Me? He says to Him, Yea, Lord; you know that I love You. Well does He say to Peter, Love you Me, and Peter answer, Amo Te, and our Lord replies again, Feed My lambs. Whereby, it appears that amor and dilectio are the same thing: especially as our Lord the third time He speaks does not say, Diligis Me, but Amas Me. He says to him the third time, Simon, son of Jonas, love you Me? A third time our Lord asks Peter whether he loves Him. Three confessions are made to answer to the three denials; that the tongue might show as much love as it had fear, and life gained draw out the voice as much as death threatened. CHRYS. A third time He asks the same question, and gives the same command; to show of what importance He esteems the superintendence of His own sheep, and how He regards it as the greatest proof of love to Him. THEOPHYL. Thence is taken the custom of threefold confession in baptism. CHRYS. The question asked for the third time disturbed him: Peter was grieved because He said to him the third time, Love you Me? He was afraid perhaps of receiving a reproof again for professing to love more than he did. So he appeals to Christ Himself: And he said to Him, Lord, you know all things, i.e. the secrets of the heart, present and to come. AUG. He was grieved because he was asked so often by Him Who knew what He asked, and gave the answer. He replies therefore from his inmost heart; you know that I love You. AUG. He says no more, He only replies what he knew himself; he knew he loved Him; whether any else loved Him he could not tell, as he could not see into another’s heart: Jesus says to him, Feed My sheep; as if to say, Be it the office of love to feed the Lord’s flock, as it was the resolution of fear to deny the Shepherd. THEOPHYL. There is a difference perhaps between lambs and sheep. The lambs are those just initiated, the sheep are the perfected. AUG. But unfaithful servants arose, who divided Christ’s flock, and handed down the division to their successors: and you hear them say, Those sheep are mine, what seek you with my sheep, I will not let you come to my sheep. If we call our sheep ours, as they call them theirs, Christ has lost His sheep. The Fathers speak for themselves. But there is one thing worth of note regarding the subject of RC allegations. There not one single quote from the Fathers when interpreting these passages that link it to Roman primacy. I am not talking about infallibility or universal jurisdiction. If there had been where the pious Church Fathers were to give the "correct" teaching about the Primacy of Rome, it had to be when commenting these passages. But it's not there. It is very clear from this comparative study that RCs allegations are contrary to traditional Orthodox Catholicism and exegesis. In this case, silence speaks louder than any loud claim. I might not have the two hours to hear it for now. Can you paraphrase what Abp. Hilarion says? Nor do they make much of Peter being named first in the lists of Apostles. They acknowledge it and *again* they never mention that Peter's honour meant lordship over the other apostles, much less that Rome would have inherited it. Moreover, the systematic witness of the Fathers is that Peter had his name changed *before* the confession that Jesus is the Son of God. Indeed, the same confession appears in another passage and there is no mention to the change of name of Peter. But Mark gives this account by way of recapitulation; for as he wished to give the names of the twelve Apostles, and was obliged to call him, Peter, his object was to intimate briefly, that he was not called this originally, but that the Lord gave him that name. Bede: And the reason that the Lord willed that he should at first be called otherwise, was that from the change itself of the name, a mystery might be conveyed to us. Peter then in Latin or in Greek means the same thing as Cephas in Hebrew, and in each language the name is drawn from, a stone. Nor can it be doubted that is the rock of which Paul spoke, “And this rock was Christ.” [1 Cor 10:4] For as Christ was the true light, and allowed also that the Apostles should be called the light of the world, [Matt 5:14] so also to Simon, who believed on the rock Christ, He gave the name of Rock. Pseudo-Jerome: Thus from obedience, which Simon signifies, the ascent is made to knowledge, which is meant by Peter. A catalogue of the names of the Apostles is given, that all false Apostles might be excluded. “The names of the twelve Apostles are these; First, Simon who is called Peter, and Andrew his brother.” To arrange them in order according to their merit is His alone who searches the secrets of all hearts. But Simon is placed first, having the surname of Peter given to distinguish him from the other Simon surnamed Chananaeus, [p. 364] from the village of Chana in Galilee where the Lord turned the water into wine. Chrys. : This is no small honour (done to Peter), He places Peter from his merit, Andrew from the nobility he had in being the brother of Peter. Mark names Andrew next after the two heads, namely, Peter and John; but this one not so; for Mark has arranged them in order of dignity. CYRIL; But mark the great carefulness of the. Evangelist. He not only says that the holy Apostles were chosen, but he enumerates them by name, that no one should dare to insert any others in the catalogue; Simon, whom he also called Peter, and Andrew his brother. BEDE; He not only surnamed Peter first, but long before this, when he was brought by Andrew, it is said, You shall be called Cephas, which is by interpretation, a stone. But Luke, wishing to mention the names of the disciples, since it was necessary to call him Peter, wished shortly to imply that this was not his name before, but the Lord had given it to him. It is long, but it's well worth listening to when you do have the time. He speaks of the fact that some people speak of Second and Third Rome but we (I believe he meant Orthodox) must admit that only First Rome still stands. As far as the organizational structure, his Eminence alludes to some of the same points dcointin has made. Just to be clear, Archbishop Hilarion does not state or imply that he accepts the papacy as it has existed for the past millennium. "For the Orthodox participants, it is clear that in the first millennium the jurisdiction of the bishop of Rome was exercised only in the West, while in the East, the territories were divided between four patriarchs – those of Constantinople, Alexandria, Antioch and Jerusalem. The bishop of Rome did not exercise any direct jurisdiction in the East in spite of the fact that in some cases Eastern hierarchs appealed to him as arbiter in theological disputes. These appeals were not systematic and can in no way be interpreted in the sense that the bishop of Rome was seen in the East as the supreme authority in the whole universal Church. It is hoped that at the next meetings of the commission, the Catholic side will agree with this position which is confirmed by numerous historical evidence." This might be a little off topic, but I'm curious as to whether Popes are ordained by the laying on of hands. I know they're elected by the college of Cardnals, I think the Cardnals are all ordained Bishops, and I think the selected Pope is usually a Cardnal--but is the new Pope actually ordained to his office by the Cardnals? No, which is one of the chief reasons to reject the non-existent order of "papacy." Only the highest order of bishop can ordain the lesser orders of priest and deacon, and chrismate. Since the Vatican believes the pope is above the bishops, it would mean the inferior would be consecrating the superior. No charism of the priesthood is given except in a Holy Mystery/Sacrament, and the Vatican doesn't even claim the existent of a Holy Mystery/Sacrament of consecrating a pope. A non-bishop can be elected pope under the present rules, but he must be consecrated a bishop before taking office. A bishop elected becomes pope the moment he accepts his election, hence the announcement "Habemus papam." ^ Isa, correct me if I'm wrong. When an Orthodox Patriarch (or Metropolitan or Archbishop) is elected by a Holy Synod (of equal Hierarchs), there is a formal announcement followed by an enthronement ceremony. The electee is merely enthroned, not re-consecrated because he was already consecrated a Bishop? So if the College of Cardinals elects a new Pope from their ranks, His enthronement may be less "formal" than the process used by Orthodox Hierarchs? Yes. Abp. Job of blessed memory was enthroned in Chicago (I was there), having been consecrated in New England where he was bishop previously. If Bp. Mark was to be translated here, he would be enthroned, but since Hieromonk Matthias may be chosen, he would be consecrated. The same applies to primates, although I cannot recall when was the last time a primate was elected who was not already consecrated. Met. Jonah missed it by a month or so. St. Gorazd was consecrated Metropolitan of Czechoslovakia, but it was not yet autocephalous. Not exactly. There was (technically, still is) a formal but only symbolic ceremony which lasts 6 hours. Pope Paul in the 60's got away from wearing the tiara, and his successors have declined to have the formal enthronement. The election of the conclave has more ritual: the last three times only an inaugural mass is served. Btw, Pope Gregory XVI was the last, in 1830, non-bishop elected pope of Rome. A Primate of any Orthodox Church is usually enthroned during a Divine Liturgy while there appears to be more pomp and circumstance (and fewer liturgics?) during a Papal Inauguaration? Bishops are not ordained they are Consecrated. The Papacy is not an order. The Papacy is an office. If the Pope is an office then the Pope could be removed from his office. I believe it has happened before in 1409, 1418, and 1439. However these councils were later decreed to be illigitimate by other councils. If the Papacy were an office, then an Ecumenical council could convene and do away with the office all together? That is exactly the problem with the claims of Vatican ecclesiology. The Vatican holds the orders of deacon, priest and bishop in the priesthood ("Holy Orders") and attributes charisms to each. She does not attribute any charism to various offices of Archbishop, Patriarch, Metropolitan, Catholicos etc. (in that, its ecclesiology resembles Orthodox ecclesiology) (I would add "Pope," the title which orginated with the Patriarch of Alexandria, but the Vatican forbids any other hierarch from holding that title, so those who submit to it at Alexandria. Another aberration of ecclesiology). Only for the office of the papacy does it claim a charism (infallibility, supremacy, etc. ), a total disconnect from the rest of even its own ecclesiology: you wouldn't claim a priest could become a bishop by accepting election without consecration nor three priests consecrating a fourth a bishop. Yet you claim your head of the episcopate takes his positin just that way. oh, the EO habbit of trying to find problems where none exist. Since we believe that St. Peter had a special (Christ appointed) role in the Church we likewise believe that that office would not go away after the death of St. Peter. The Bishop of Rome possesses more authority than the other Bishops precisely because he is the Bishop of Rome. That does not mean he ceases to be a Bishop once he becomes Pope or that there is another level of the Sacrament of Holy Orders which is above Bishop; it just means that, being that he is the Bishop of Rome, his job description just got a lot bigger. ...find problems where none exist. Original sin does exist and is a big problem. Christ Who knew no sin became sin for us and solved the problem. We are still born into original sin. Baptism cleanses us of it. Of course, that doesn't solve the problem of the Theotokos being born into sin and God the Son needing a spotless vessel with which to enter the world, hence the necessity of the Immaculate Conception. Your inconsistencies are not our problems. If you treated the office of the papacy like an office (like the Archbishops, Patriarchs, Catholicos, Metropolitans etc. you have), we might have some to talk about at those talks. But you treat it as another order: a deacon cannot "confect the Eucharist," a priest cannot ordain, a bishop cannot speak infallibly. Deacons can't ordain a priest, priest cannot consecrate a bishop, and no number of bishops (following the principle ennuciated in Hebrews that "without contradiction, the inferior is blessed by the superior") can elevate a supreme pontiff. Hence we have nothing to talk about when it comes to "reunion."